In this Paul Whiteman-athon, a number of famous songsmiths: George Gershwin (I'll Build a Stairway to Paradise, Do It Again! ), Irving Berlin (Lazy, What'll I Do), Rudolf Friml (March of the Musketeers), Rodgers and Hart (Do I Hear You Saying), George M. Cohan (You Remind Me of Your Mother), and Domenico Savino (Burning Sands; credited to D. Onivas), with Savino also acting as arranger for O, Ya Ya. 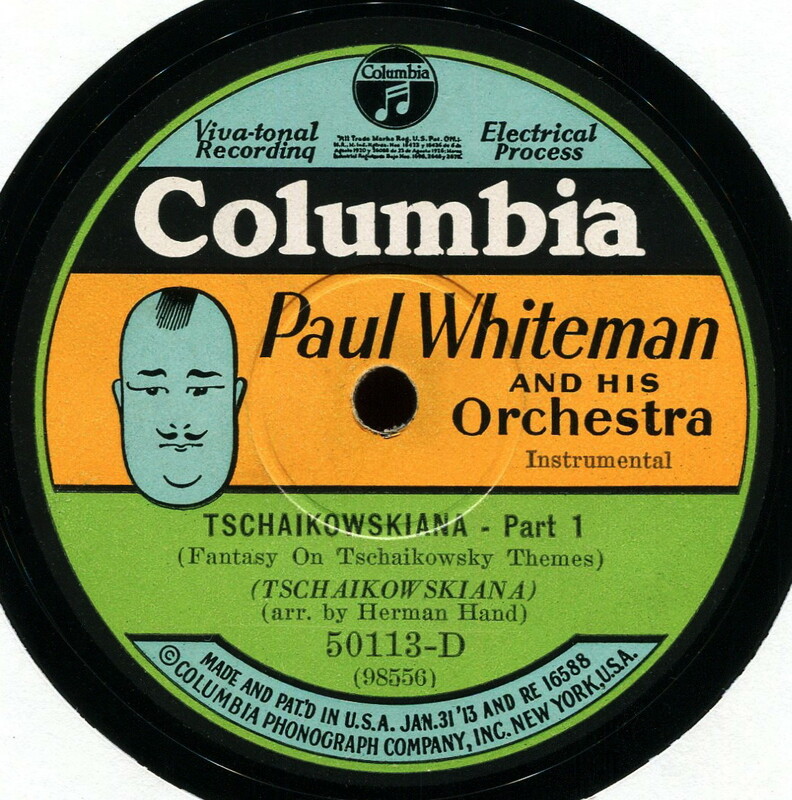 And there's a two-sided 12-inch Columbia disc called Tschaikowskiana, arranged by Herman Hand, which is exactly what it sounds like. It's not the most exciting medley, but it does show a great deal more respect for Tschaikowsky/kovsky than Spike Jones ever did. A number of big Whiteman hits here, including the million-selling 1923 Linger Awhile, which revives the Whispering slide whistle, only with clever syncopated horn punctuation, making this almost definitely a Ferde Grofe arrangement, though it's not listed as such at the William College page. It's him, though. Has to be. The two Gershwin numbers are, of course, pre-Rhapsody in Blue, and I'm 99 percent sure these are Grofe charts, too. 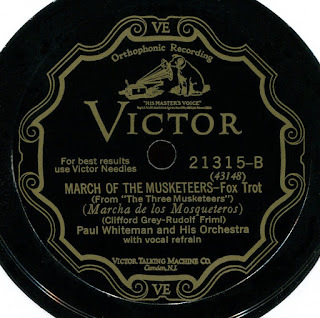 The singers include Bing Crosby, Al Rinker, Charles Gaylord, Austin "Skin" Young, Billy Murray, John Sperzel, Fritz Zimmerman (yodeling), The King's Jesters, and Jack Fulton (during the March of the Musketeers vocal refrain). These were all ripped and edited by me from 78s in my collection, and it looks like I have enough sides ripped for three more parts. We'll see. I mean, we'll hear. Thanks once again, Lee - this is a great contribution to the web's music space! He switched to Columbia in 1928--it was always my understanding that he was pissed at Victor for not giving him exclusive recording rights to certain hits, though my Google searches tell me Whiteman left because he felt threatened by Nat Shilkret, who was director of light music for Victor and leader of a studio dance band with lots of dance htis. At any rate, PW felt he wasn't getting enough respect, so he left for Columbia in 1928, didn't do all that great at Columbia, and returned to Victor in 1931. 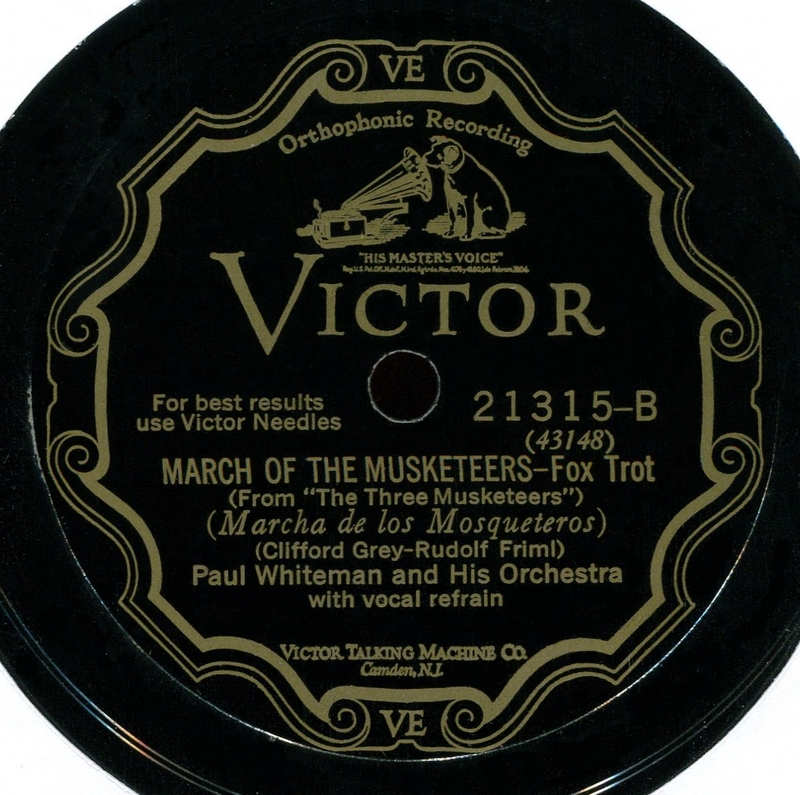 In anticipation of his label switch, Victor had Whiteman record a huge number of sides in 1928 so it could compete with his Columbia discs. In the late 1930s, PW went to Decca. Then he ended up on Coral, then Waldorf Music Hall and Grand Award. He did some fake hits on Waldorf. Whoever he recorded for, he certainly had the best stable of songwriters imaginable, probably the finest line up in history, so far at least.. My understanding of why he left Victor matches yours. You can still find stacks of Nat Shilkret records out there. I imagine as Victor's biggest seller and considering his higher profile and celebrity along with all the profits he brought in to the company, Whiteman felt those hits should have been his. No doubt Victor regretted his joyful, high profile departure and were happy to have him back, even if to some extent, the bloom was off the Whitman rosebush by then. I agree--it was modern corporate stupidity, late-1920s edition. Someone does wonders for your label, so you cut him or her down to size as a thank you, and never mind that no entity, no matter how big and cocky, can afford to mess over the folks who made it succeed. But that didn't stop Victor--it was the big label, so it got cocky. Columbia emphasized larger-than-life arrangements, and so Ferde Grofe did his worst stuff there. (Grofe's dreadful "American Tune" chart was so over-arranged, the musicians couldn't even keep time in the closing bars). Whiteman had found his groove, and then he's at a new label with a new sound (literally--that wonderful brittle Victor fidelity was gone), and, since Columbia's mission was to compete with Victor, there was far less room (or permission) for innovation. Such a sad, useless tragedy. And yes, PW was becoming old hat by the time of his Victor return, even if the fabulous Grand Canyon Suite was waxed post-Columbia, since swing was already making its way into the mainstream, and swing was not his thing. Meanwhile, Grofe was working freelance, which had Whiteman furious and panicky (PW needed Grofe but his ego couldn't admit it). There was some fine post-Columbia Victor stuff, the "symphonic jazz" pieces especially ("Deep Purple" was extraordinarily good), but much was boring, and some of it sounded like a poor imitation of Guy Lombardo. Hard to figure, given PW's genius for choosing vocalists, but at least a couple of his '30s singers were bizarrely bad. Thanks so much Lee. Lots of Whiteman here I've never heard before.